I won a first-place Wisconsin College Media Association award for my photo that appeared in my feature story on Holocaust victim and survivor Nate Taffel. I won a first-place Wisconsin College Media Association award, along with fellow classmates, for our series of stories on Holocaust survivors. I won a second-place Society of Professional Journalists Mark of Excellence Regional Award for my feature story on St. Norbert women’s soccer player Katie Vanden Avond as she approached NCAA Division III history. I won a first-place Society of Professional Journalists Mark of Excellence Regional Award for my feature story on Holocaust victim and survivor Nate Taffel. I won a first-place Society of Professional Journalists Mark of Excellence Regional Award, along with fellow classmates, for our series of stories on Holocaust survivors. 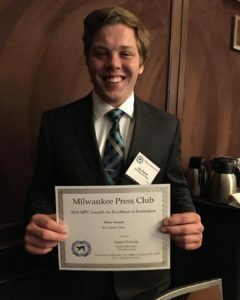 I won a second-place Society of Professional Journalists Mark of Excellence Regional Award, along with fellow classmates, for our series of stories on helping to find the final missing photos of Wisconsin service members who died in Vietnam. I won a first-place investigative reporting award, along with fellow classmates, for our series of stories on helping to find the final missing photos of Wisconsin service members who died in Vietnam.